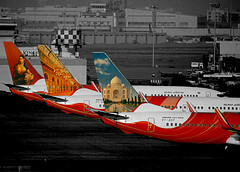 Posted: Fri Jan 27, 2012 10:07 pm Post subject: Kolkata ( NSCBI ) Airport: past, present and future. 1915-20: A grass strip airport started on an extended area of Dum Dum cantonment with only east-west runway. Today it has been abandoned and you can see this runway on google map as taxiway starting from main runway on the south side near 01R. It was extensively used by mail aircrafts and Royal Air Force. KLM used to use it for refueling stop for its Indonesia flight. Tagore took this flight for his trip to Iran/Iraq. 1930-32: BOAC predecessor of British Airways started flights to Australia and Far East via DumDum airport. Soon the airport became a very important refueling stop in world aviation map. 1940-42:Second world war started and Imperial Japanese Army occupied Burma. A new runway was build which is today’s secondary runway ( 19R-01L, about 8000ft ).This runway was extensively used for lunching B17 bombers to Burma front..
1943-46: Japanese army over ran allied positions in Burma and infiltrated Nagaland/Monipour area. Singapour over ran by Jap Navy. Allied commander Lord Mountbatten decided to fortify DumDum airport. A parallel runway further east was built which became today’s main runway ( 19L-01R , about 10,000ft) . No intersecting runway was ever thought of because both runways could be knocked off by bombing at the point of intersection. These two runways lunched steady stream of B17/24 bombers to Burma front. For about 2-3 years DumDum airport became Asia’s busiest airport. The airport itself was guarded by a US marine division based at nearby Birati camp. Still today there are retired US air force personnel with fond memories of DumDum airport. 1950s: After independence the airport continued to be major entry port to India and a major refueling stop in world map. BOAC, KLM, PanAm, Lufthansa, AirFrance, Swiss Air, TWA and many more used to fly out of the airport. Only Air India had little activity here. 1962 and Chinese war: The invasion of NEFA ( Arunachal Pradesh ) by Chinese Army put Kolkata airport into forefront of defense related activity. A lot of supplies were airlifted from the airport to frontline positions. Main runway was extended to today’s length of 12,000 ft and turning pads were added at both end. This runway could now handle the largest aircrafts like C-5 Galaxy and Antonovs .Decision was taken to build a new terminal at the airport. !967-70: Communists took over W.Bengal and anarchy spreads all over the state. Many Foreign airlines stopped landing at the airport. CCU lost its importance as an international entry point. 1971 and Bangladesh War: The airport again came back to headline at the start of Bangladesh war. Two para brigades were lunched from the airport inside East Pakistan and Indian air force heroically defended airspace over Kolkata from the airport. Captured Pakistani generals and diplomatic staffs were evacuated via this airport. However airspace over Kolkata was closed to international traffic for some time. Airport was heavily defended by SAM2/3 missiles and AAG. At this time current international terminal started to function and one could see the apron area from inside! 1972-77: A decision was made to downgrade CCU to a domestic airport only. International flights were scares, Boeing 747 pressed into service eliminating the need to refuel. However three upstart airlines in the east namely Thai, Singapour and Biman started to use the airport besides BA and Aeroflot and this generated some international traffic load. Airport International Hotel was also opened was a stopover point for transit passengers . Some improvements in taxiway and ATC system also took place. 1979: Sino-Vietnam war broke out and Soviet Union started supplying Vietnam via this airport. American spy satellite took a picture of huge Antonov -22 taking off from 19L was published in NY Times and for the first times we had an idea about what CCU airport runway looks like well before goggle map! 1987: Ex pilot Rajeev Gandhi had a soft corner about CCU and he took personal initiative to fund for what is today’s domestic terminal at a cost of $15.0 million. Royal Jordanian Airlines and Jugoslav Air started biweekly flights to CCU. 1995-96: Airport was renamed as Netaji Subash Chandra Bose and his statue was installed at the terminal. Air bridge operation started and the new domestic terminal with 4 million pax .capacity started functioning. 2005-08: Boom time for Indian civil aviation. At last W. Bengal chief minister demanded that our airport has to be developed to international standard. Planning commission objected saying Kolkata is full of poor people, they could not afford. Initially it was decided to built an annex to current international terminal to function as international departure. But AAI suddenly discovered a vast track of land nearby called airport jheel. An integrated terminal was planned to handle 20 million domestic/international pax. Prime minister himself understood the situation and went ahead with this proposal .In the mean time the domestic terminal keep handling twice the capacity and old international terminal handling 1 million pax. per year. 2009-present: Construction of huge 40,000 sq. meter terminal is still going on. This L shaped terminal will face secondary runway in the east and Indian airlines hangar complex on the south side. Satellite pictures and visitors picture shows brisk construction activity still going on. A total of 14-16 gates will be installed. A few will be restricted for international operations only which will most likely be on the south side. The construction of a huge 1200 car garage and over bridge linking the departure terminal with VIP road are also part of this project. In addition apron area on the south side of the airport and secondary runway has been extended. A new ILS antenna could be seen on the south side of the secondary runway ( GE picture ). These additions have made Kolkata airport a perfect parallel runway system. Both runways could be used in near simultaneous mode enhancing handling capacity. I hope with all these new features our ancient Kolkata airport will attract few more international airlines besides current group of middle eastern and SE Asian airlines which will help US/Europe bound passengers in near future. Nice to see the airport getting upgraded by the communist government in power in the area. Sadly with the tossing out of TATA Motors in region Kolkota lost any hope for big time business to open. The communist government running the region has screwed Kolkata to the max. At least there will be a nice airport in the area much cannot be said for anything else in the area or city! Sabyasachi, this is a very nice compilation of historical nuggets. Can you also add pictures, including marking points and regions of interest on maps? We have had a thread on the Mumbai airport at Santa Cruz, but not too many pieces of information about CCU. I had long suspected the presence of an earlier runway at the point where you mentioned about it - thanks for validating that! It is also interesting to see in the Google Maps satellite picture, three main propeller planes of a bygone era. This is at the south east end: an HAL-748, a DC-3, and a Fokker Friendship F-27. Any other information on these planes? Very nice information Sabya - thanks for posting! Especially interesting to me was the history behind the airport, how it shot into prominence during wars in the neighbourhood etc. East-West runway: Yes, there was an east/west runway here in old Dum Dum airport. I remember my dad took us a tour to this airport as early as 1967 when I was a school boy. I saw a Focker Friendship tubo plane taking off from that runway. Current international terminal ( which is a cowshed ) was not even built in those days. You could easily view the remnant of this runway here: http://www.wikimapia.org/#lat=22.6422838&lon=88.445617&z=17&l=0&m=b. This runway ceased to exist as more and more jet aircrafts like Caravel and B737 started to visit the airport in early seventies authorities started to use only the parallel runway system. Jet aircrafts are less dependent on wind flow direction than a prop. aircraft. This ancient runway is now a part of south apron area which will harbor the new integrated terminal.AAI have plans to relocate the CPWD campus and possibly CG hangar to make more space for further extension of this terminal. Please enjoy and wish for INDIA! Sabyasachi, you were very lucky to be able to see the now-defunct runway in active operation! First, it will be nice if you could post pictures and other new items on the progress of the new terminal at CCU. Even if you could point to your old skyscrapercity posts, it will be very informative for members of this forum! Second, runways are designed with the dominant wind directions in mind - more so, now-a-days, than before. There are very few parameters when designing a new airport. In the war-time typically, one would not pay that much attention to these parameters, and a piece of plain level ground with the right parameters would suffice. My guess is that the dominant wind directions are in the direction in which the current two parallel runways are. This is what I learnt from an architect in the family, so my information is definitely not first-hand. Posted: Sun Jan 29, 2012 8:04 pm Post subject: Old prop. aircrafts near now defunct east-west runway. I don’t know the history of all these aircrafts. But the DC-3 parked here had illustrious history and here it is: In 1948 South East Asian country Indonesia was in the midst of liberation movement from Dutch colonial army. At one point Dutch army cornered the leader of Indonesian freedom movement Mr. Sukarno. He then frantically send a secret message to prime minister of new Indian govt. Pandit Nehru for help. Pandit Nehru instructed one of the finest pilot India had at that time Biju Pattanaik to dash for Indonesia. Biju took his DC-3 Dakota , went all the way to Java, Indonesia and rescued Mr. Sukarno to safety. Years later Indonesia became a free country with Mr. Sukarno as prime minister. Since then Biju’s Dakota was parked at one corner of NSCBI (Dum Dum ) airport. This is the DC-3 you saw in Wikimapia picture. In any other city of the world such a plane would end up in a museum with pictures of Biju and Mr. Sukarna, describing all the events associated with it. But Kolkata babus don’t care for their history and have no future ahead. So this DC-3 a piece of history is rotting over there. I suggest to remove this plane to nearby Barackpour cantonment for safe storage. My word...this was an incredibly informative post, Sabyasachi! I was completely in the dark about this facet of information about the great Biju Patnaik. As a kid growing up in Delhi in the 1970s, I was only aware of him as a politician who laid the foundation for a modern Orissa/Odisha. I had not known about his exploits as a pilot in WW2, the Kashmir operations, or the Indonesia one. What also surprises me a bit is that this DC-3 should possibly be a monument outside the small but stylish Biju Patnaik airport at Bhubaneshwar. I have visited the beautiful and clean city once - in December 2008. The airport is small, but clean and functional. It has some very nice traditional fabric decoration hangings from the ceiling, and has wheels on the airside, representative of the Konark Chakras. It would be very nice and apt if the plane is restored, and finds a place outside the airport. Thanks once again for such a wonderful piece of information that I was completely unaware of, possibly many others on this forum, too. Talking about earlier runways, there was a thread on BOM on a third runway. Member Shivendra Shukla points out that the current taxiway from the Palam technical area in DEL, which cuts the secondary runway 09-27, and joins the main runway 10-28 was a runway in the olden days, when Safdarjung was Delhi's main airport, and Palam was an air base. Sumantra, this aircraft is not in flying condition and falling apart. Also who is going to pay for historical artifact restorations. AAI don’t have money. The east west runway that I saw in 1967 was probably unidirectional, as it did not have any turning pad on both sides. It also could not handle today’s much heavier aircrafts. In the early days of aviation aircrafts were lighter and required small take off/ landing distance. Today’s F class aircrafts are 500 tons fully loaded. They could not use such runways. Modern high bypass jet engines have so much thrust that runway surface must be specially designed and made vibration proof. In that respect DC-3 is no match for DC-10 or B747.So naturally old runways were converted to taxiways. Prevailing wind pattern in Kolkata area is from south or south east direction in summer or rainy season, and due north during winter time . The current location of the parallel runways are such that they could be used in both direction day or nite as they are perfectly north south runways. Only problem is they have a separation of only 650 ft. could not be used simultaneously. Sabyasachi, thanks for the update on the Biju Patnaik DC-3. It is sad to know that it is in a bad condition. I wonder if Odisha's current Chief Minister knows about his father's plane, and its history. As regards parallel runway operation at CCU, initially I had never seen the secondary runway being used (I am not a regular visitor to CCU), leading me to speculate that it might be in use more as a taxiway. However, I could scarcely believe my eyes in 2008 when I actually saw it - this was on 17 Aug (Sun), 2008, in the morning. I was waiting for IT 602, the DEL-CCU 09:35 am - 11:40 am flight. The two runways were in use, and I saw an Air Sahara CRJ taking off from the secondary runway, southward. There were other landings and take-offs on the primary runway. This was possibly a somewhat rare happening, more of an exception, than a rule. Thanks for the interesting history of CCU airport. A small bit of trivia from my side. In the 1950s and early 1960s, CCU was the base for four Douglas -DC4 Skymaster aircraft operated by Indian Airlines( known as IAC in those days). These aircraft were the first long range airplanes to operate from Indian soil with Indian registry( not AI's L-749 Connies, as many people believe). They were used on the Calcutta-Port Blair route and were replaced by Vickers Viscounts later on. A couple of these DC4 were stored in CCU and were still around during the 1980s. I believe they were chopped up sometime in the late 1980s. Thanks also for letting us know the whereabouts of Biju Patnak's DC-3. I have always wondered where that airplane was. It has, as you have mentioned, a remarkable history. Besides rescuing Soekarno from Indonesia, Biju also flew it to London many times in the 1950s. Biju as a young man was a pompous buffoon with the sexual appetite of a rogue elephant, it was said. He had a keen eye on the wives of some of the diplomats working at the Indian High Commission in London. He would use this DC-3 fly these ladies to Paris on romantic weekend breaks, and no points for guessing what would have happened there ! Khushwant Singh has mentioned these trips in his book 'Truth, Love and a little Malice ' . Sumantra, the secondary runway you are talking is an extremely well built feature of NSCBI airport. Originally it was built as 8000 ft runway but now it is 10,300 ft. It has turning pads on both sides and associated taxiways. Southside is fitted with ILS antenna. Width of this runway extended to 200 ft. Now it is projected to handle F class aircrafts. In the early morning rush hour this runway takes bulk of the load as it requires very little taxing distance. I have used this runway several times including last July I landed here on an AI flight at nite 11.00 PM. But generally at nite time it is used as taxiway as you could see edge lights are changed to violet from usual white high intensity lights. I will post a few videos of this runway later on. @The_Goat: those were quite interesting pieces of trivia. The DC-4 story, and the Biju Patnaik London trips. Sabyasachi: this thread is getting more interesting day-by-day! You really have a wealth of information on CCU. I look forward to your videos, and more additions to this thread! @ The Goat : Thanks for the input about Biju and his stories. If you know any more stories about Kolkata airport please post it here. As Kolkata airport is undergoing a massive transformation I am trying to record all about its past and future here. Sabyasachi, do you have some more information about the WW2 period operations from DumDum? Kharagpur/Midnapore also had some bases, from which some `Hump' operations were conducted (I remember seeing some photographs of the USAF staff in that region). One of the hangers behind the Hijli detention camp is from that era, I believe. Do you have more information on this? Quite a few abandoned airstrips are present in Bengal. It is not economically viable to activate them. Some could be used by ISRO, others could be converted into factory or university campus. Camp Kancha in Halisahar/Kanchrapara area on Kalyani expressway, which is in ruins but could be fixed if IAF agrees and private money available. Dhubulia airstrip is near the township Birnagar in Nadia dist. It played a very important role in Bangladesh war of 1971. Hawker Hunter based from this airstrip attacked Pak forces in Jessore sector and war ended quickly. It is completely occupied by refugees from Bangladesh but you could see the runway/taxiway in Wikimapia. Perhaps this list is incomplete. Bengal being a border state a few airstrips are missing from the list; Dhubulia airstrip, an airstrip near Faracca barrage, Alipourduarse and many more in tea garden areas. But does that mean we have to reactivate all of them ? No. only a few could be profitably activated. Foremost of them Camp Kancharapara air field, then Andal, Balurghat ( ? ), possibly Kalaikunda. Unless Purulia is developed as a major center for Steel/coal industry its airfield will bite the dust. Camp Kancha is of particular interest to all of us since its runway is 5000ft although crumbling could be extended to 7500 ft. It is near Kolkata connected by highways. Tuboprop and small jets from North East could land here relieving the pressure on NSCBI airport. I think Bengal’s crazy and childish politicians should count on this airport first before talking about all other airports. But will IAF give up this airstrip at all? Thank you, Sabyasachi - I ask a small question, and you answer a much bigger question! I wish everything in life were like that! By the way, your post has more interesting airports than what the Wikipedia page shows! While you dig out more gems of information for us, my question was specifically directed at Kharagpur. A search on `IIT Kharagpur, Kharagpur, West Bengal, India' on maps.google.com will give an overview of IITKgp. Zoom in to the maximum - you will see a structure marked `hanger' (spelling mistake, of course!). I have seen the rusting remains of a P-40 Curtiss Warhawk behind the Aeronautical Engineering Department way back in 1983. This is no longer there. In front of the Hijli detention camp now (near the hangar), is now a Hawker Hunter - which can also be seen from the Google Maps image. Which is the WW2 era airfield which had this hangar? A search for Chakulia on maps.google.com leads one to a place in Jharkhand. Is it then the Dudhkundi airfield? No, Dudhkundi seems to be closer to Kalaikunda. I am completely confused, now. Camp Kancha in Halisahar/Kanchrapara area on Kalyani expressway, which is in ruins but could be fixed if IAF agrees and private money available. Dhubulia airstrip is near the township Birnagar in Nadia dist. It played important role in Bangladesh war of 1971. Hawker Hunter based from this airstrip attacked Pak forces in Jessore sector and war ended quickly. It is completely occupied by refugees from Bangladesh but you could see the runway/taxiway in Wikimapia. This list is incomplete. Bengal being a border state a few airstrips are missing from the list; an airstrip near Faracca barrage, Alipourduarse and many more in tea garden areas. But does that mean we have to reactivate all of them ? No. only a few could be profitably activated. Foremost of them Camp Kancharapara air field, then Andal, Balurghat ( ? ), possibly Kalaikunda. Unless Purulia is developed as a major center for Steel/coal industry its airfield will bite the dust. Yes, Chakulia is in Jharkhand and is reported to be test/firing range of IAF. Daudkandi is very close to Kalaikunda. These links are working in my computer .Please try, the air field in question will be at the center of the field. Wikimapia is best for these types of survey since you get a text box with all the information in it. This one is particularly interesting. There are some structures which look like hangars on the top left side of the runway. They also look fairly intact and useable. Mr. The Goat , you are right. This airport was used last time during 1971 Bangladesh Liberation war. IAF still owns this place but don’t know what they are going to do with it. It should go in private hands. During WW II Camp Kancha was the base of Spitfire and Mastang units of RAF. These long range fighters used to give fighter cover to bomber ( B-17, 24 ) taking off from Dum Dum airport targeting Burma/SE Asian sector. Since those days it was rarely used. Bomber aircrafts belonged to 10 Bombardment group of US Army Air Force. Sabyasachi and @The_Goat, I am not sure how the Kachrapara airstrip would be of use to Calcutta. The only two airports which experience congestion at DEL and BOM. CCU - doesn't get that much traffic at all. The current terminal building is small, but with the new one coming up, this should ease out most of the airport's problems, for some years to come. I don't know - will a new airport close to CCU be really worth it, more so, for smaller aircraft operating mainly to the north-east? Kalyani's connectivity to Calcutta has been a bit better after the highway was built - so I hear. These links are working in my computer .Please try, the air field in question will be at the center of the field. Thanks a lot for restoring the links, and wow - what a find! Thanks once again for all the hard work into finding these airstrips on the map. However, my Kharagpur question still remains unanswered. I have been wondering about this place, and the Curtiss Warhawk ever since 1983, without getting any satisfactory answer. Was there a temporary grass airfield somewhere close-by, whose remnants were wiped out by the sands (grasses!) of time? Sabyasachi, thanks for your efforts. Unfortuantely, much of the information in the map is wrong. I will summarise it as follows. 1. I am quite familiar with the area. I was there first in 1983, then in 1995, and after that, quite a few times. The mystery remains. 2. The plane shown in the map is a retired Hawker Hunter from Kalaikonda - in front of the Hijli Jail. 3. The plane I saw in 1983 was behind the Aerospace Engineering Department (marked as `AERO') on the map, and was a Curtiss A-40 Warhawk. The Aerospace Department is a bit north West of the place you have marked on the map. 4. On enquiring about it in 1983, I was told that it was a crashed aircraft from the WW2 era, when an American airbase was close to the area. I am interested to know which airbase it was, and where is it now. It could be the Dudhkundi one, but wait - there is a Hangar (spelt `hanger') on Google Maps INSIDE the IIT Kharagpur campus (a bit North East of the place where the Hawker Hunter currently is). I suspect a WW2 era grass airfield to have been very close to this place. 5. How do I know it was a Curtiss A-40 Warhawk? It was told that it was an American aircraft which had seen action in WW2. It was clearly not a P-51 Mustang - the tail was Spitfire-like, which could only point to the Curtiss A-40 Warhawk, which had seen action in the area, at that time. The propeller and engine parts peeping outside the front fuselage are exactly how I remember it. 6. Any further help? I will really appreciate it. I am getting the sinking feeling that I am up against a wall, without much more information coming in...I have some sharp memories of this place in 1983, and while I do not have any proof, I could/still can recognise a few historical planes with some degree of confidence. Of course, I am an amateur, and go wrong at times, but this is something I have some confidence about. 7. The Hijli Detention camp - I know something about its history, as I have gone around this place quite extensively. I will post this quite soon. No, I do not have any affiliation with IIT Kharagpur, though I would have loved to! Here is continuing my post on the slightly unrelated Hijli Detention Camp. In 1983, I had seen the two points on the ground and first floor, respectively, where two freedom fighters Santosh Kumar Mitra and Tarakeshwar Sengupta (who were unarmed) were brutally gunned down by the British guards. These markings are no longer there. Netaji had himself come over to take charge of their bodies. Tagore's inscription is still there on a tablet at a small grass circle on the way to the building. It is interesting that India's family of premier Engineering/Technology institutions - the IITs, started off from a centre of the freedom struggle. In 1983, there were the cells on the outside, in thick grass and undergrowth which were a bit dangerous to reach because of poisonous snakes frequenting the locality (but I did it, nevertheless). There was also an old lock of the British era on the second cell. There is a solitary confinement cell (close to the Hangar). Old IIT Kharagpur'ites speak of the `Hijli Jail' as it is more popularly known, to be haunted, and did not visit the near-abouts after sunset. This is not the oldest structure on the campus, however - it is the collector's house, between the Central School, and the Tech Guest House. This is a 1928 structure, and is still in use. Back to some aviation-related items, which should be of much more interest to people on this forum. One of the joys of visiting the place is to see the IAF exercises overhead, at Kalaikonda. I had seen Hunters in the sky in 1983. In 1995, I saw a solitary Mig-25 from the Trisonics squadron, which had possibly made a visit to the place. This was the only time I have actually seen a Mig-25 in the sky, overhead. This was followed by Mig-27s/Mig-23BNs, and finally, the plane I was looking for - the Mig-21! The Hump is a term used to describe trans Himalayan airlift service organized by USAAF. In 1942 Burma was overrun by Japanese Army and Burma Road connecting South China and East India was cut off. US high Command decided to organize an airlift operation to supply Nationalist Chinese government of Chiang Kai Sk and US Army units operating in that area. The job was entrusted to tenth bombardment group and then to a separate army air transport command ( ATC ). Theater of operation: Airports in and around the port city Calcutta were earmarked for loading points. Some of these air bases are Panaghar, Andal, Kalaikunda, Dum Dum and Barackpour air base, Gaya , Purulia etc. Aircrafts used to fly all the way to Jorhat and Chabua ( Dibrughar, Assam ), rest and refuel. Then they used to over fly great Himalaya and PatKoi mountain range and used to land on Chinese controlled city Kun Ming ; off load their goods and fly back to Calcutta area via Chabua/ Jorhat. This flight path was very difficult to navigate. Five mighty rivers like Brahmaputra, Irawati, Salween, Mekong and others flow here from north to south direction. Each river created its own deep gorge which are hundreds of mile length and 15,000 ft deep. This area was sparsely populated with little visible landmark. Wind speed at normal cruising altitude 125 miles/ h. No radio nav. aids were available in those days. A row of eight buddist pagodas were only sign of nearby Kun Ming airport. Besides weather related problems Hump operation were also affected by presence of Japanese fighter aircrafts in nearby Myitkyina air base of north Burma. In fact Japanese used this air base for bombing raids to Chabua a few times. Aircrafts used: C-47, 39 and 53 were primarily used but later stage modified B-24 Liberators suitable for cargo operation were also used. Although these aircrafts were no match for today’s military cargo planes but huge numbers ( 650 aircraft total ) made up the deficiency in freight capacity. In four years of hump operation handled almost 700,000 tons of cargo ( Ammo, fuel, medicine, spare parts even earth moving machines ) were airlifted. Before Berlin airlift this was the largest air cargo operation in the world. At the end of WW II, 600 cargo planes were lost with 2000 American lives. This Air Transport Command was awarded US Congress Distinguish Service Medal. Command Center: Rishra, a small town 20 miles north of Calcutta was the command center of Hump operation. Here in an abandoned jute mill American General Lt. Gen. George E. Stratemeyer set up his flight operation center. Allied forces set up elaborate infrastructural facilities all over India to control such large scale aircraft movements. Airframe repair were from Bangalore and Agra, turbo engine repair centers were Barrackpour air base. Many India ground crews were trained here and later on became members of independent India’s air force. The Hump operation ushered the aeronautical technology in India. At end of 2nd world war many of these cargo aircrafts were used to start up air transport companies like Kalinga Airways of Biju Pattanaik. A few years later when India needed to have its own Hump operation into the Kashmir valley ( 1948 ) many of these aircrafts were again used without any problem. Since 1942 much water passed through Mekong and Ganges river. Now Kun Ming is the 4th largest airport of China handling 20 million passengers / year. Kolkata somehow have survived in spite of all odds and handling 10 million passengers / year. It is connected to Kun Ming by jet aircrafts on a weekly basis and Himalyan hump is no problem at all. Chabua is the eastern most airbase of India and now handles Su-30, it has recently refurbished with extended runway. Jorhat handles two IAF sqdns. guarding China front. Both Barackpour and Kalaikunda are IAF bases with major repair facility. Panaghar is still handling transport aircrafts. Abandoned Andal airport is being rebuilt with private money into a jet airport. Gaya airport is now handling international traffic from SE asia. Very informative post, Sabyasachi - thank you! Nice links, and good pointers to the places in Wikimapia. I was missing something for the two days this thread went without a post - please keep the good stuff coming! fantastic discussion going on here folks! Sumantra, I thank you for asking me to write about The Hump operation. I want other member should also contribute in this forum about Kolkata airport. It requires lot of web search. Thanks, Aseem - this is really interesting. On the whole, I enjoy informative discussions on this forum, where members dig out pieces of information, and also, locked pieces of memory! Sabyasachi, with regard to the last point: for a old-plane junkie like me, it was a bit odd to read about the C-46 Curtiss Commando only in the early 1980s. Interestingly, it was an article on `The Hump' in the US embassy magazine, SPAN. There was a picture of this odd snub-nosed plane, with a weird double-bubble profile. I was intrigued. The hump operations also surprised me, since two places involved in the operations were places I had visited - two otherwise non-descript places in Bongland (Kharagpur, Kalyani/Barrackpur/Kachrapara). And I had only known bits-and-pieces of all this, since I knew that some WW2 operations had taken place from here. I read and re-read the SPAN article many times, poured over the photos, and tired to seek out as much information as I could, from the nearby library. There used to be a decaying C-46 frame at DEL in front of Terminal 1A, which was moved out some time DIAL came into being. Obviously, the sight of a decaying airframe at an airport looks ominous, but this is a somewhat rare aircraft! I wonder where it is now. Sumantra, hump like operation is still going on in Kolkata as large Indian troops mostly mountain divisions posted in North East India are being supplied from Kolkata area. Not everything is going by air because rail/road connectivity is much better than 1942. But airports in Kolkata area are still being used and this has made Kolkata airport a power projection type of airport rather than tourism or blue color desi export type. As a result India’s federal govt. will never be able to ignore this airport( NSCBI ) no matter what the internal political equations are. In USA memories of Hump is alive and well. About 2000 airmen died over the hump , most could not be traced because of inhospitable terrain. Even today attempts are going on to locate lost aircrafts of WW II era in this area with occasional success. Two US marine divisions were involved in guarding Calcutta and Chabua airports. Some of those marine are still alive in their eighties, one lives here in New Jersey. Wow Sabyasachi - one US WW2 Hump airman whom you know! I am sure you would have more stories to regale us with. We are looking forward to them! Yes, air connectivity is extremely important for the North-Eastern part of the country. In my very limited trips to Calcutta, I did not manage to catch any troop movement. I see them in Delhi however, quite regularly. These used to be the old IC 3xxx series of charter flights for the armed forces, international assignments from the then T2, and now, fairly regular movements from T3. Three cheers to their spirit! New Integrated Terminal of Kolkata Airport: I found a few updates about the new integrated terminal under construction at Kolkata’s NSCBI airport in these youtube videos. They clearly show the layout of domestic and international wings, new apron areas and the flyover adjoining this terminal. We hope construction will be over by end of this year. It is capable of handling 20 million passengers per year. This will be third largest terminal in India and it is much smaller than Delhi’s T3. Thanks, Sabyasachi - these look quite impressive. The second video also shows that some of the Domestic-International gates will be common. This will be something new for an Indian airport, right? Further, will the arrival crowd mingle with the departing crowd in the same place, or will they be segmented, as in current Indian airports? Delhi's IGI T3 does this neatly on two floors, this will hopefully be relatively immune to a large increase in traffic, when the extra space will make it a boon. I don’t know the internal arrangement of the cityside of this terminal. But it will be like any other two storied terminals. May be a few gates will be only for international flights. Kolkata domestic is really huge, its exact scope is not known. Now it is handling 9 million passenger / year but once more flights are available in a bigger terminal this number will surely go up many fold. As an entry point of Eastern India this terminal is long over due.